The Hagens take their Palomino pop-up truck camper deep into the Oregon and Idaho wilderness. Don’t miss their BLM and National Forest tips, and stunning photography. The Bureau of Land Management administers approximately 256 million acres of public lands in the United States. According to Wikipedia, that’s one-eighth of the landmass in the United States. Much of this BLM land is available to the public for free. Boondocking anyone? Unlike national and state parks, most BLM land doesn’t appear on your typical map or GPS database. In fact, you could be driving past hundreds of miles of BLM lands and not even know it. So how do you go about finding and using BLM lands? To learn about the opportunities of BLM and National Forests, we talked to Brian and Chris Hagen. The Hagens are passionate off-road and off-the-grid enthusiasts with years of BLM and National Forest experience. 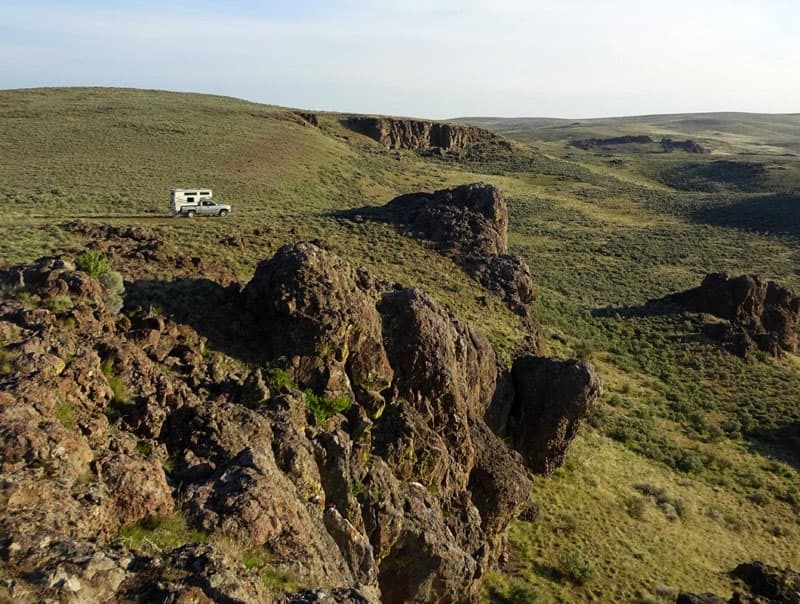 Now on their second Palomino pop-up truck camper, the Hagens share their knowledge about finding, accessing, and using BLM and National Forest land, and reveal some of their favorite destinations. Get your bucket list out and a pen. You’re going to need it. TCM: How did you get into camping on Bureau of Land Management (BLM) areas? Brian: For me, camping away from campgrounds, called dispersed camping or boondocking, started with my parents. When I was a kid, we would go camping in the backcountry. As adults, Chris and I like solitude. Chris: My dad was a Boy Scout leader. He didn’t want to be around people when he was camping. TCM: That’s understandable. How do you find BLM camping opportunities for truck camping? Brian: On BLM lands and in the National Forests you are pretty much allowed to camp anywhere you want. In some National Forests there are “No Camping” signs, but that tends to be the exception, and they are usually there due to environmental concerns and wildlife protection. When we’re in the National Forests we usually camp in the National Forest campgrounds. We try to go on weekdays so that we have the campgrounds mostly to ourselves. The National Forests have quite a few developed campgrounds. Some have campground hosts and take reservations. They are very basic with a fire pit, picnic table, outhouse, and campsite. You pay at a self-serve kiosk by the honor system. Some forest service campgrounds are free. BLM camping is even less organized. 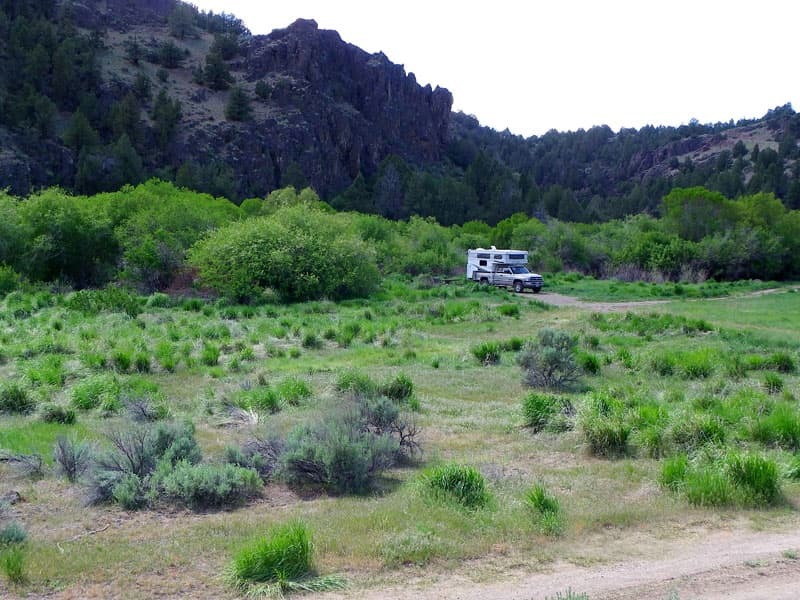 Very rarely will there be formal campgrounds on BLM lands. Most of the time, it’s just land. We have never found a BLM campground that charges fees. You can camp pretty much anywhere you want on BLM lands. The legal limit for camping is fourteen days on both BLM and National Forest lands. After that, you need to move on.